When it comes to the most demanding tactical footwear on the planet, professionals use Bates. The Bates E02276 GX-8 Desert Composite Toe Side Zip Boot has all the bells and whistles tactical performers are looking for. This boot was designed for hot weather use and features a breathable and lightweight upper made from high-quality nylon and Wolverine Warrior suede leather. A nonmetallic composite toe provides protection from crushing dangers while making this food safe in hazardous electrical environments and ideal for airports where x-ray equipment is present. A convenient side zipper is ideal when you need to be ready in the matter of seconds. A Bates slip resistant rubber outsole provides excellent traction on wet and oily surfaces and on uneven terrain. And athletic we inspired design makes this boot ideal for physically daunting tasks and missions that require dexterity and balance. I'm an avid hiker and I've put many, many miles on them and use them from everything to running errands on the weekends. I have used them every day for the past eight months and have had no problems until now. The zipper is starting to get "rough" and takes some effort on the left boot to zip up. I have a feeling the right boot will have the same problem soon. I hoped for better. I wear these 10-12 hours a day on the work site. I wear these in the winter since it gets wet and having a Goretex boots really helps. I have another pair of the unlined tan Bates for the spring and summer. The fit on these GX8s was great. They feel slightly wider than the summer version. The "side out" leather sort wasn't as hard to keep clean as I thought. It's a liitle like microseude. Overall great boot. I will be buying again! Awesome boots. Had these for a month. Very comfortable. Shipping was fast. Extremely breathable in the summer heat and amazingly warm in sub zero temperatures. 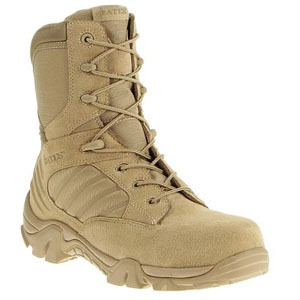 Better and lighter than military-issued boots too. Excellent boot for use on the flight line with a protective composite toe as well. Fit was great out of the box. Just what I would expect from Bates. Back in the day we were issued full leather boots that took several weeks to break in. These boots are great. Unbelievably, I put them on before I went to work and they were broken in by lunchtime. Amazing! I just got this last week and right out-of-the-box they do require some breaking in. My toes were sore for a couple of days but I think they're okay now. Good tactical boot for the money. The zipper is a little light duty so I hope it holds up. This is my fifth pair of Bates. I've been wearing Bates boots for close to 10 years now. These new lightweight boots are just as durable as the older heavier models they used to sell. I work at a correctional facility so there's not too much outdoor use but these have held together really well after about a year. They still look good cosmetically. I had a major injury over 10 years ago so I've got some metal parts in my leg and seem to work with. Same Bates quality with an updated look and lightweight. Highly recommended. I work on an Air Force flight line here at Dover AFB. This is my second pair of Bates GX boots and I'm very happy with them. It's really important to have a lightweight durable boot for my job with composite toe protection and these boots definitely do the job. The only reason I had to buy another pair is because the first ones got greasy and dirty after eight months. Overall I'm very satisfied with these boots and I definitely recommend them. these boots are the most comfortable boots I've owned so far. It provide excellent ankle support for me. Some people may think they are too restrictive but but they are perfect and have definitely saves me from twisted my ankle in the past. They definitely improve your confidence when walking or running on dirt or rocky surfaces. I did add a Dr. Scholl's insole for extra padding and so far have no complaints. I'd recommend these boots to anyone as an all-around great boot at a good price.